I need to be a little more organized in my life and from that decided having a notepad on my fridge is the ideal spot, as it’s somewhere I go far too often in the day. 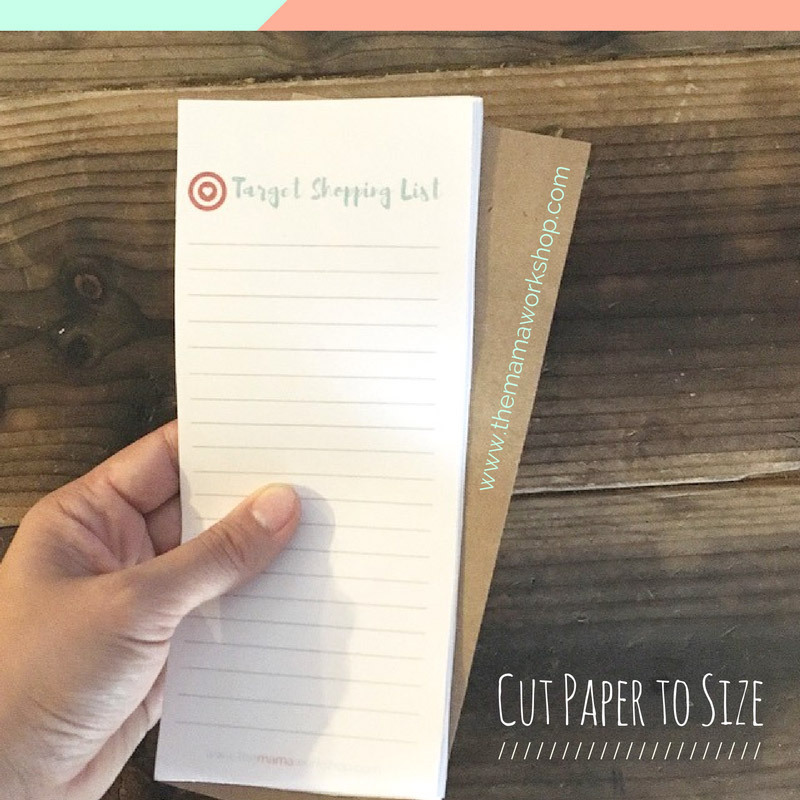 This super easy to make printable from Melanie is ideal for those of us who wander aimlessly around the grocery store purchasing everything but the one thing we actually needed. All you need is a color printer, some notepad glue, and a clamp to hold things in place when things get messy. 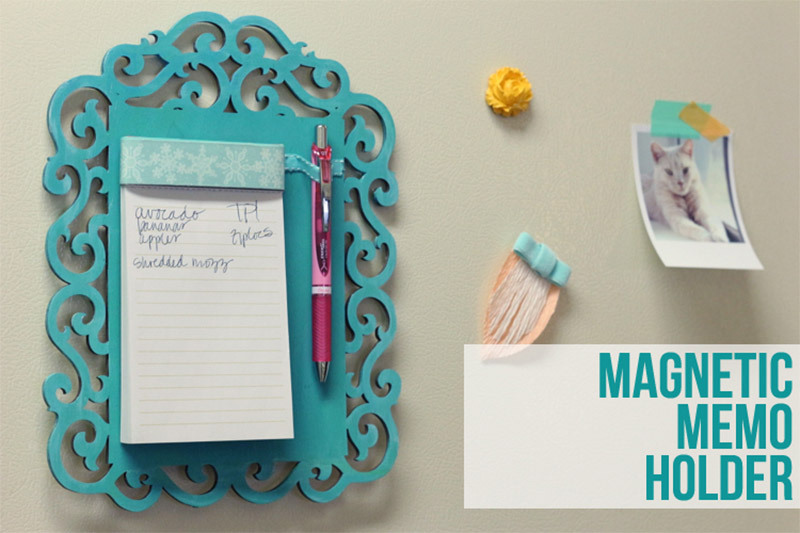 You will also need some magnetic tape if you want to pop this onto the fridge, which makes it ideal as you can add groceries to the list as you use them. My inner forgetful self is so grateful for this idea. Cristina is the queen of recycling and never wants to see anything go to waste. 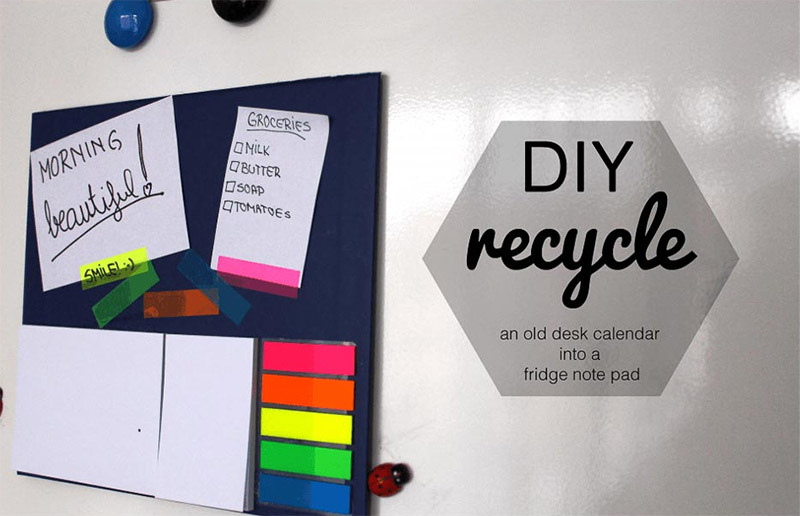 This vibrant and fun refrigerator notepad is actually made from an old desk calendar and will cost buttons to make if you already have yourself a glue gun and a box cutter. Next we have another easy to make printable option. This is ideal for you moms out there. Or perhaps you can do this for a friend who’s a mom as this makes a great gift. Printables are actually my life right now. I love how the creative folk online always pay it forward and provide free printables on their websites. It makes my life soo much easier. Thank you, wonderful people! Anyway. All you need for this cute notepad is the free downloadable which you can grab here. 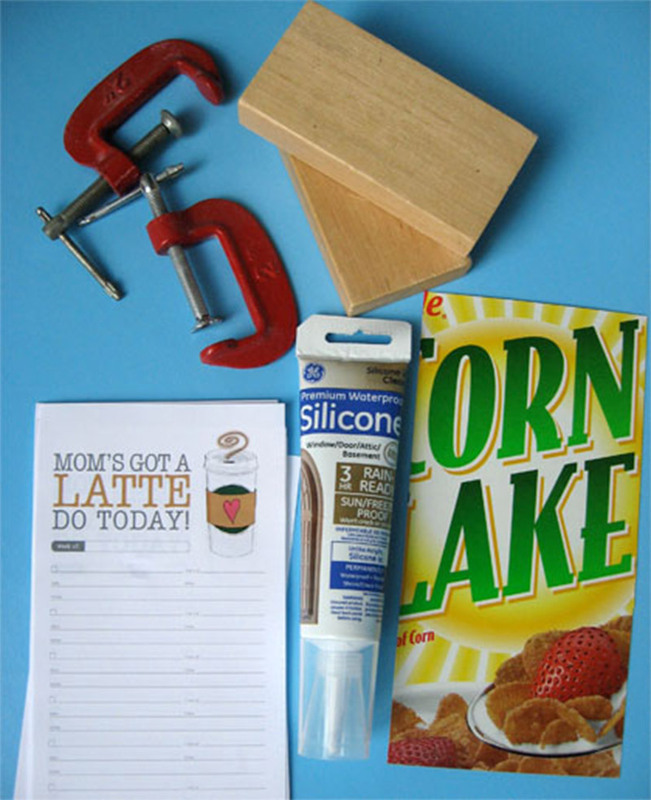 Plus some strong glue, wood blocks (to help with the gluing process), cardboard (a cereal box will do—yum!) and some magnetic strips. There you have it. 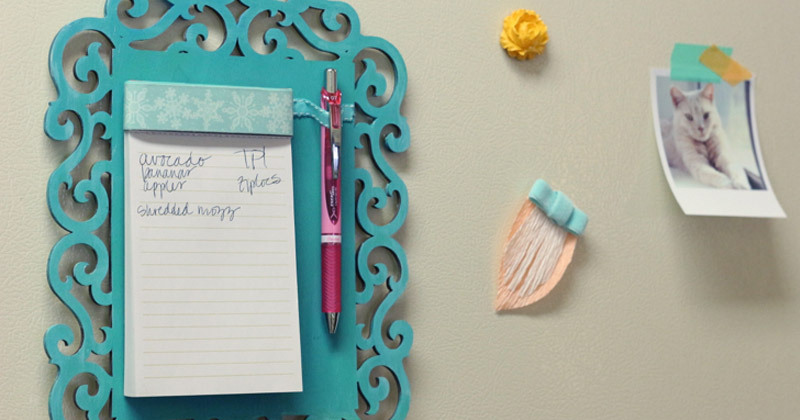 An easily accessible to do list for all you moms on the go. I loveee hamburgers. Hey, I love food full stop. 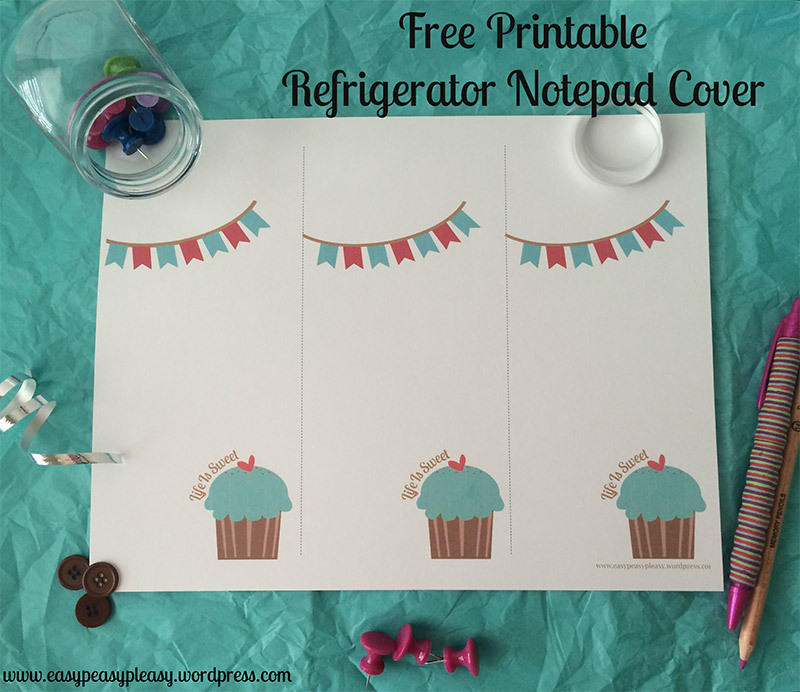 Why else would I be writing a post on refrigerator notepads? I spend half my life in the kitchen and from all my experience with burgers this YouTube tutorial totally caught my eye. I found this hamburger notebook not only super cute, but very easy to make. It’s cheap too. Pick up your favorite food related notebook from your local dollar store or check Amazon and stick a magnet to it. The rings on the notebook make a neat pen holder too. Do you have heaps of half-used notebooks lying around everywhere? Well before you go out and buy yet another set, why not make the most of what you have and recycle something that’s a little off season?! Lacie re-vamped her out of season notebook in less than ten minutes by pairing some nice ribbon with her little printable cover. Quick and oh-so easy. Mary Ellen Riley is the expert when it comes to creating the perfect gift for loved ones. 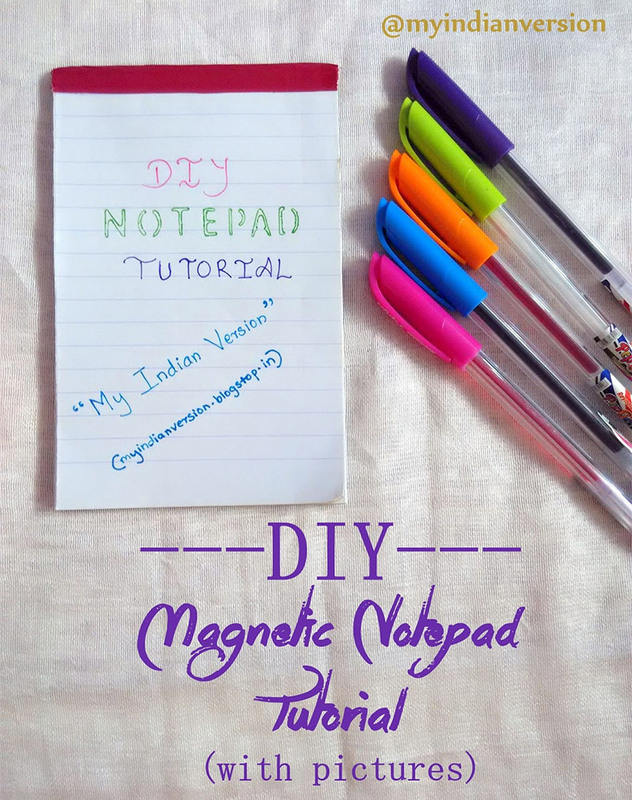 Her go-to DIY gift is her magnetic notepad, of which she has a plethora of cool designs. 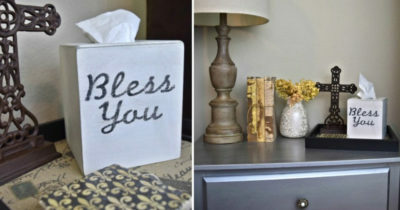 She takes a simple notepad and turns it into something practical and fun with items you’re sure to have around the home. Especially if you’re the creative type. My personal favorites are her post-it note designs. They’re very simply created from some eccentric backing paper affixed to a cereal box and some fun stickers. You can grab these from any craft store. Better yet, why not recycle fun stickers or 3D decorations from old present boxes you’ve received? 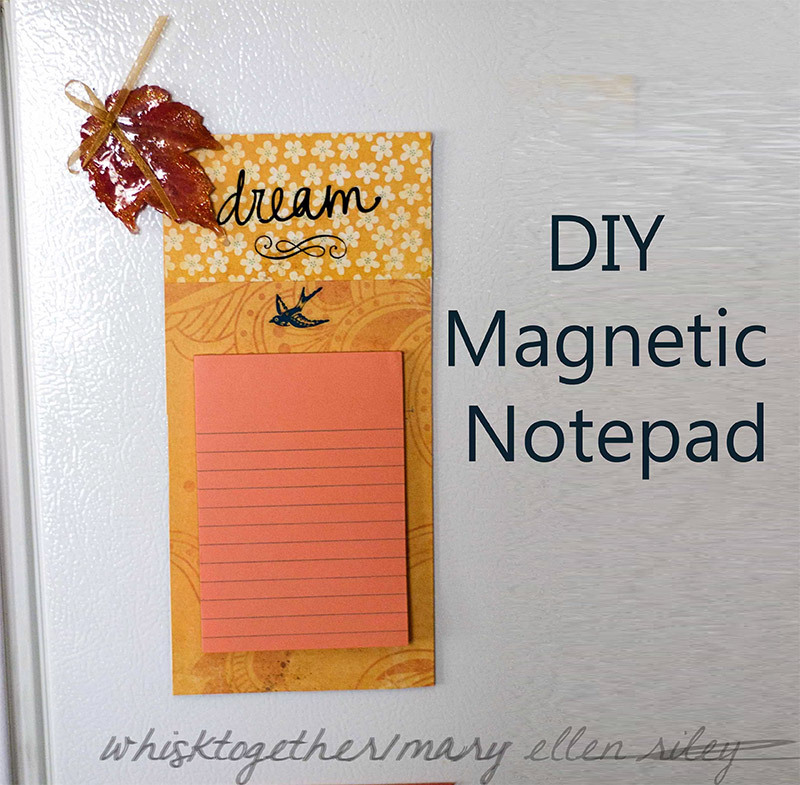 If you’re looking for something a little fancier than a simple memo book stuck to the fridge, Katie has the answer for you. She created this all-in-one memo holder board which comfortably fits any notepad along with your pen. You list makers are going to love it. It’s super chic and easy to make. I love the turquoise color Katie decided on but if that’s not for you then just pick up some craft paint in your preferred color. And don’t worry! You don’t have to be a master carpenter, the wooden plaque came as-is. So no intricate carving for this one required. I kinda want one of these in every room of my house. Don’t you agree? You have got to love Sweta’s commitment to the cause here. 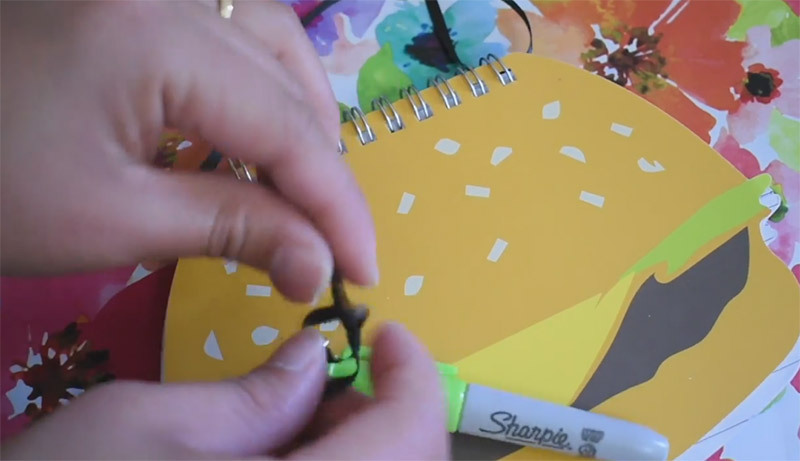 She makes the whole notebook from scratch in this awesome DIY tutorial. She recycles materials she already has in & around the home. 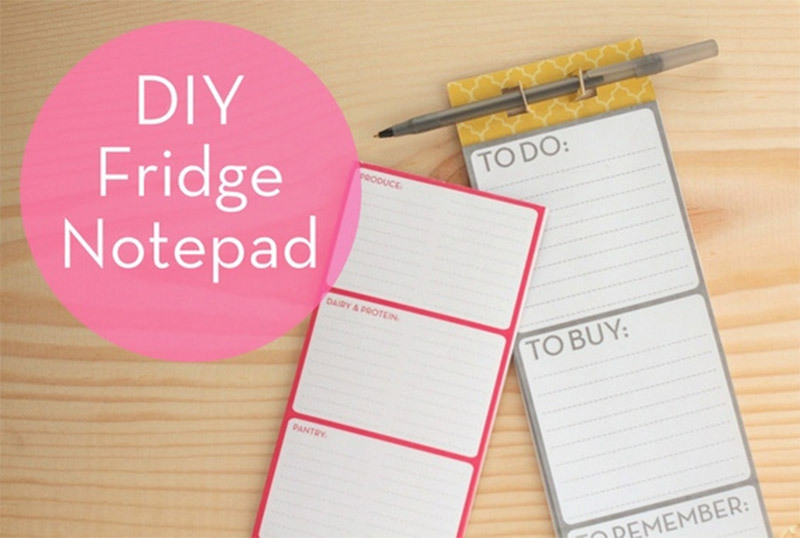 How many of us are guilty of using half a notepad? Or throwing out a notebook if the cover falls apart? Put these pages to good use in this tutorial! Ok, so when I saw how good this Tweety Pie was I felt a bit gutted. I mean, no way could I craft something as good as this. Especially with my(or should I say lack of) drawing skills. Don’t fear though. This tutorial is crazy easy to follow. 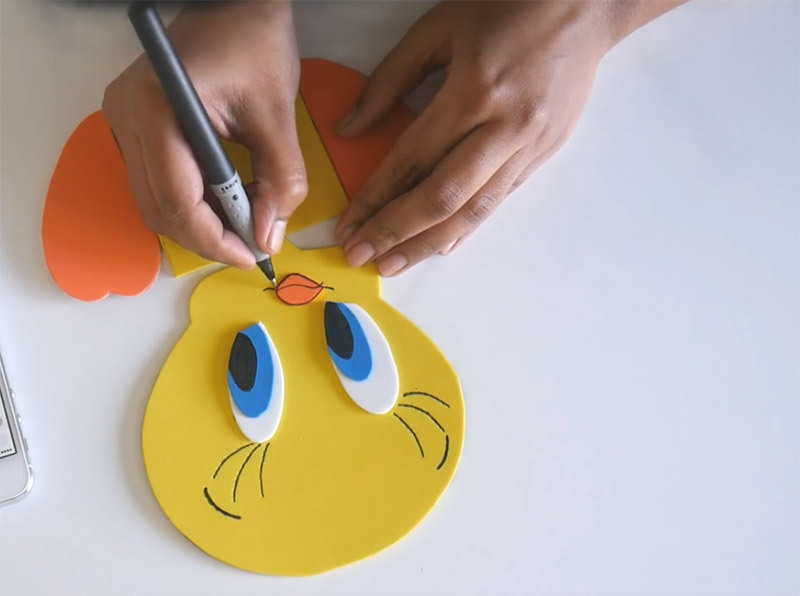 You don’t even have to draw a picture of Tweety. Hello printables, my old friend! You just need to be able to work a pair of scissors and have some patience. And trust me… If I can, you can too. Simply cut out the image and use it as a stencil for each of the foam pieces. Genius. And super professional looking. 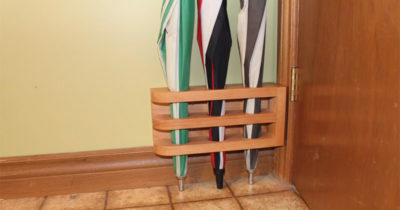 I am convinced this would cost a fortune from a store and you can make it on the cheap in less than an hour. Who doesn’t love Target? I know I’m convinced that over the years, days of my life have been spent in there. Ludavia loves Target so much that she created her own notepad dedicated to her Target shopping list. Now that’s love.